The answer might be a strategy you haven’t tried before—video. If you’ve tried all the “regular” methods for building up your market share and getting new buyers, video might be the secret recipe you need to try for maximum success. By using video, you can stand apart from your competitors and engage people with your offerings in a unique way. Today, we’ll explore how video can help you reach new leads and buyers. We’ll look at specific ways to convert leads on your site, through social media, and in your sales funnel. By the end of this article, you’ll know exactly how to start finding people excited about your brand and ready to buy. The first and simplest way to use videos to generate leads is to incorporate them into your existing lead funnel process. Most websites include some form of a subscription box, contact form, or email signup area. By adding video to nearly any step in your lead generation process, you can keep visitors engaged and increase conversions. You can either create the video to become a direct part of the lead-generation process or incorporate it into your existing layout. Have you ever wanted to download an eBook, whitepaper, checklist, or report, but needed to enter contact information first? These types of free downloads are a standard way to generate new leads. They’re so popular, in fact, that it’s been estimated that around 80% of B2B content resources are gated. And while most of these are text-based resources (typically PDF documents), there’s no reason you can’t use video instead. The first way to use this gated content is by offering it almost exactly like a free report. Show what’s available, then require contact information before taking the visitor to the page where they can watch the video. 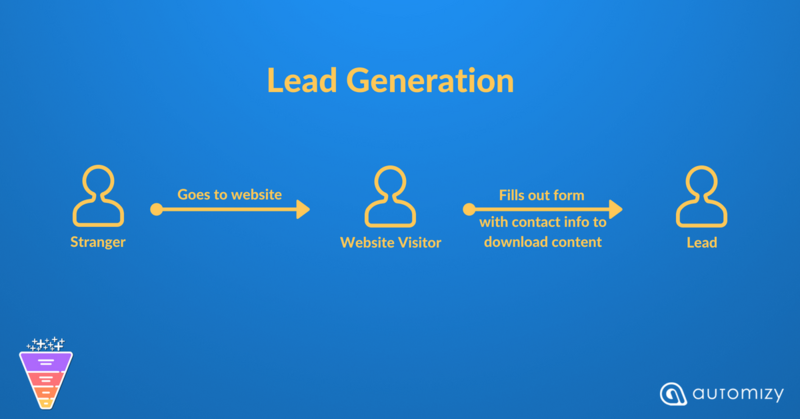 This method, where you require lead information before watching, is the easiest and fastest to set up with an existing lead-generation funnel. This is the strategy Salesforce uses on their nonprofit signup page. The second strategy is a bit more complicated but results in higher engagement since the visitor is already invested in the video. In this strategy, the visitor is allowed to start viewing the start of the video—but lead information is required to see the entire piece of media. 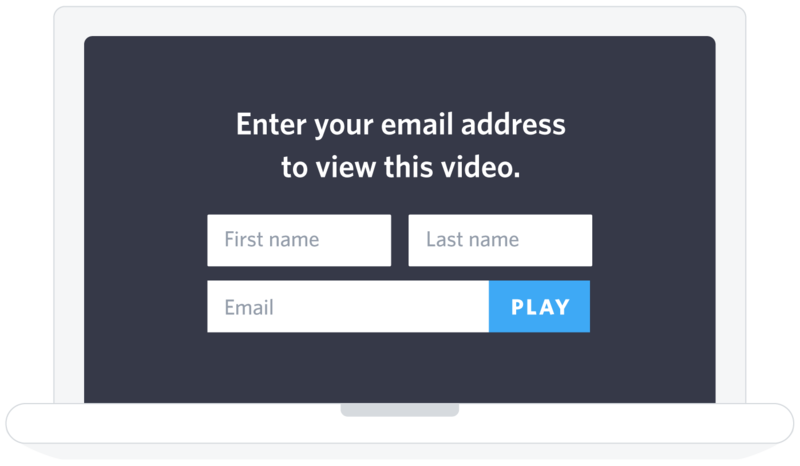 Sometime during the course of the video itself, typically before the most important or interesting parts of the content, the viewer is invited to provide their email address to keep watching the clip. There are a few different platforms where you can include this capability, and you can also add it to your own videos with custom coding. It should be noted that Wistia only hosts existing video files and doesn’t have the capability or software to create them. Another platform you can use for hosting is Vidyard, which includes a number of marketing features like Wistia. The final way to convert leads using video is to include media on your primary landing page. Of course, this takes a more coordinated video strategy, including planning a video for the page in advance, but it’s the method that makes the best use of video’s strengths. A great example of this is the Swagbucks homepage, which splits the above-the-fold screen real estate into two calls to action—a signup button and a video prompt. The next strategy to use video for lead generation is to include a call-to-action in every video. It’s easy to create a video that’s compelling and engaging. But if you don’t have a final action you encourage the user to take, you’re not going to see much success from your video campaign. 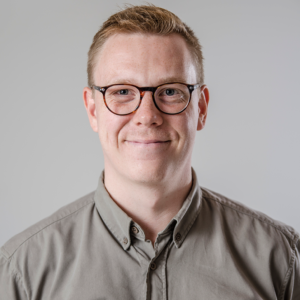 A call to action might just be reiterating the main focus of the video in the last few frames to remind the viewers of what the video is all about. As you start planning videos for your lead generation strategy, you can also design videos around their call to action before even creating the script. Either way, a call to action can transform a boring, lifeless video into a converting piece of content. Clicking the play button brings up a full-screen embedded YouTube video explaining Swagbucks in under a minute. It’s a riskier move to be sure since video isn’t as easy to switch and adjust like a five-word headline. But with the number of top companies using this strategy, it seems to be worth the effort. Today, social media dominates our lives—and it’s the same with lead generation. If you’re overlooking social media’s role in finding new prospects and customers, you’re missing out. Thankfully, video can be a great way to drive engagement on social platforms. There’s just something about a live video stream that makes it more compelling. People are more likely to tune in and watch, which means you can attract more prospects and generate new leads. Even better, you can reuse previously-recorded live content in future promotions. 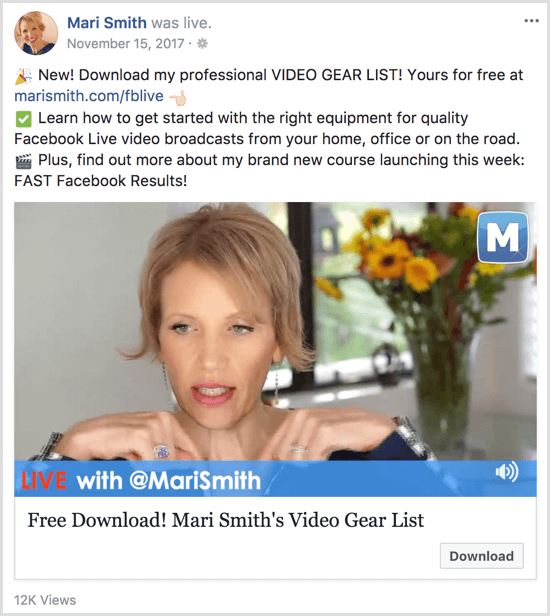 When Mari Smith promoted her free content in a live video, she was able to then share that video again and drive even more leads through a paid ad. To get started, decide whether Facebook or YouTube would be a better channel for you. Plan out the basic premise behind what you’ll cover in your live video, then start! You are, probably, wondering how to actually create a captivating video you will be using in your lead generation? And what if you don’t have any design skills or a huge budget to produce a high-quality video? No problem. The creation of professional-looking videos is not anymore a luxury that only large companies with huge budgets can afford. A number of marketers create videos on one platform, then stop. Don’t do that. Instead, create videos and share it across different social networks. For this reason, it’s a good idea to upload it to a platform that works well with sharing. You can easily create social-media style square videos with Moovly and then promote them across different networks. If you’re going to all the work of creating a video, you should be getting as much use as you possibly can with the work you put in. The best way to do that is to repurpose content in different forms. While videos tend to do well on social media, not everyone wants to (or can) watch a video, especially if it has sound. A great way to expand the reach of video is by taking the concepts and turning them into other forms of media, which can then be shared on social networks and around the internet. 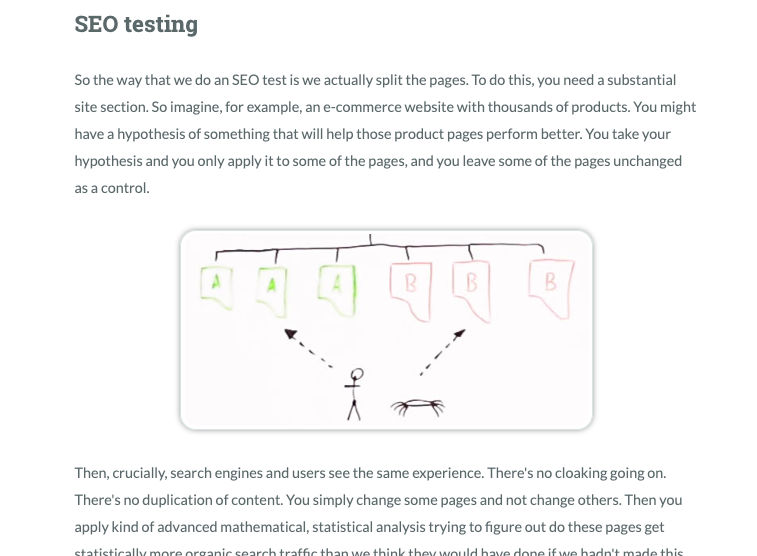 A great example of this is the Whiteboard Friday series over at Moz. 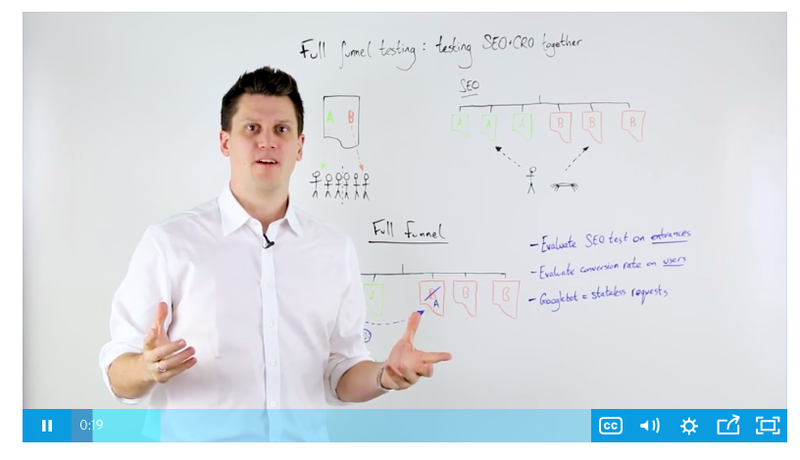 Each Friday, a member of the team goes on film to present an SEO concept with—you guessed it—a whiteboard diagram. But they don’t stop with video. Moz takes the transcript of that video, along with photos of the whiteboard, and creates a blog post. If you’re already creating videos, this is a great way to expand their reach on social media and around the web. You can tweet quote snippets, share screen captures as images, develop the concepts into an infographic, and so much more. You can even generate new video content out of the production by trimming short clips from the full-length piece. So far, we’ve covered more subtle ways to incorporate video into your current strategy. You can add them to a landing page, share them on social media, and repurpose them for other types of outreach. In fact, you can replace every step in your lead acquisition process with a piece of video content. 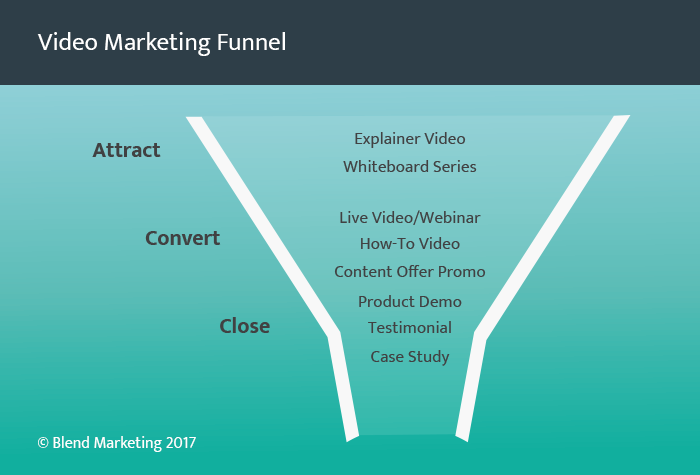 Each stage requires different messaging, and you can use video throughout each layer of the funnel. Let’s break down how and where you can include video and what types of content you’ll need at each stage of the conversion process. When you’re reaching people for the first time, you can’t start off with a pure marketing message. Instead, you’ll want to warm up prospects with a video doing one of two things: explaining your unique selling proposition, or offering value. First, one of the best ways to reach prospects is with an explainer video. This is a simple and short film designed to introduce new visitors to a concept, product, or company. 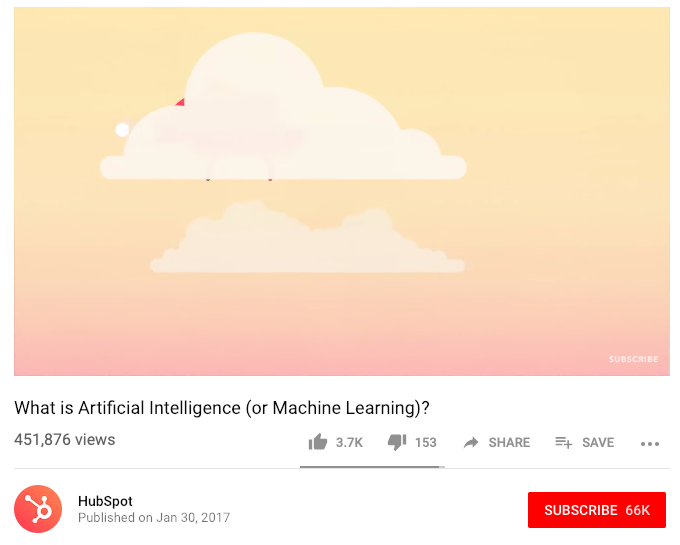 A great example of this is the explainer video on artificial intelligence by HubSpot, which has generated over 450,000 views. You can create different types of explainer videos for different aspects of the customer journey. 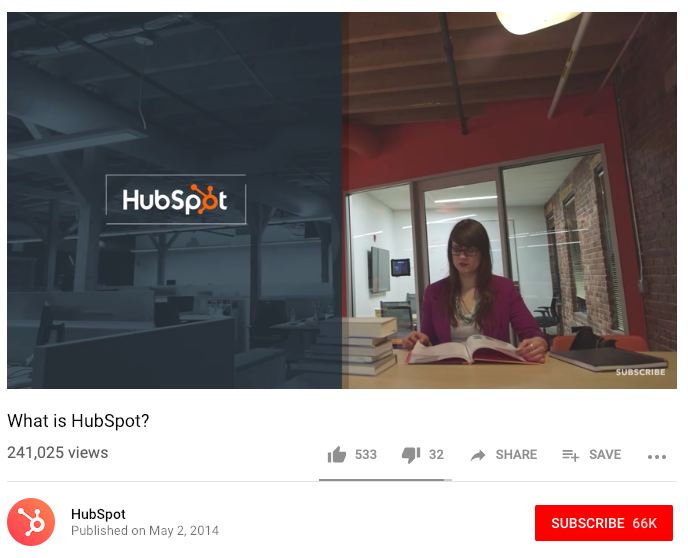 In HubSpot’s example, it’s not a video explaining HubSpot. Instead, it’s elaborating on a topic HubSpot’s target audience is likely also interested in. But this is really the exception that proves the rule. Typically, most explainer videos are a demonstration of what the company has to offer. 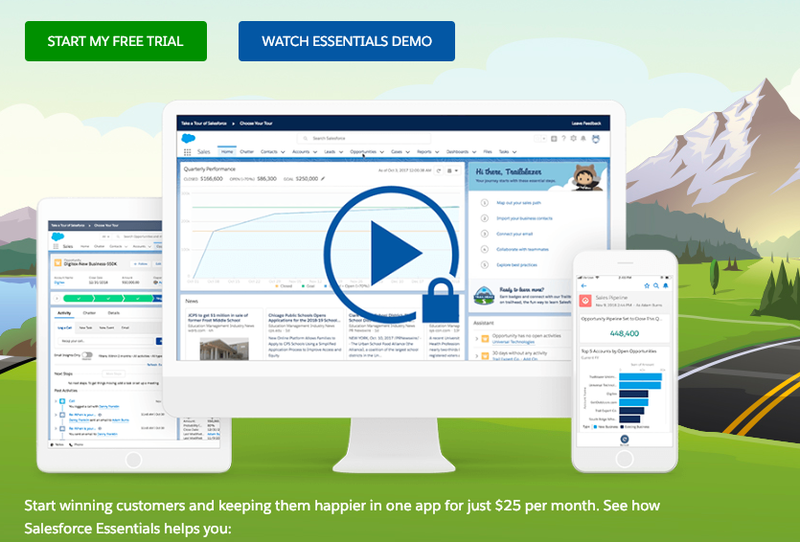 And even HubSpot has an explainer video telling what they’re all about, too. Just remember—it doesn’t have to be focused exclusively on your company, as long as the viewer is interested in the topic. The next type of video isn’t built for piquing a viewer’s interest or getting him or her to buy. In fact, it might not even mention the company’s product at all. This is by providing value, and one of the best ways to do this is with a helpful video series. 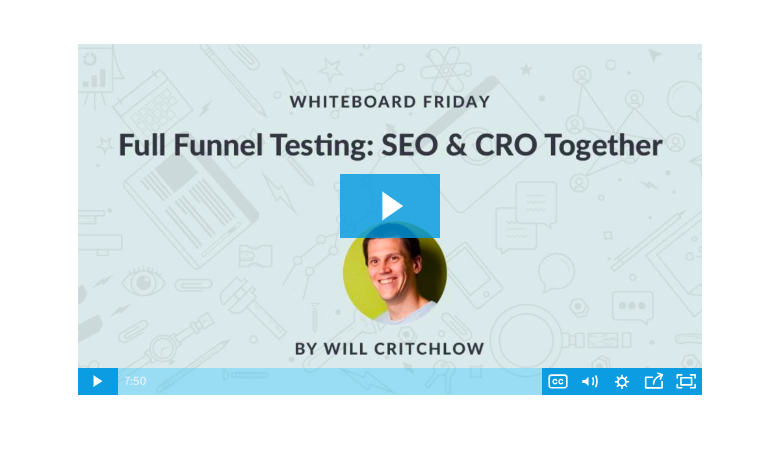 Earlier, we mentioned the Moz Whiteboard Friday series as an example of great repurposed content. But it’s also the perfect example of a high-quality, free educational video to engage prospects. It’s not a commercial for Moz software, but a way to engage with potential prospects before directly asking them to buy. Once they are interested in buying, it’s time to encourage selling through sales-driven video. As just about anyone can tell you, social proof is a powerful tool for persuading nearly anyone to buy something. And videos are an amazing way to use social proof. With video, there’s an advantage because the viewer feels closer to those presenting than with pure text. While marketers constantly try to add authenticity to their testimonials with headshots, names, titles, and other indicators, video trumps them all. When persuading with social proof through video, the best two strategies are testimonials and case studies. The critical difference between the two is that testimonials are usually nothing but the customer’s words, whereas a case study includes external analysis on the project and results. If you’re struggling to convert visitors into customers, these types of media can do the trick perfectly. If you’re looking to start generating more leads for your business, try video. Nearly any step in the conversion process can be done with video and gives you the solid advantages video has over pure text. When you’re attracting new visitors to your site, are you converting as many of them as you’d like? To solve the problem, consider adding gated video content or even converting your home page to a video-centric landing page. For social media purposes, live streams can work wonders at converting unengaged viewers into raving fans and buyers. And repurposing and resharing that content can convert viewers across different platforms. Finally, video can help you expand your sales funnel. At each stage from prospect to buyer, you can keep people interested and persuaded using custom video messages crafted to bring them to the next stage in the sales journey. If you’re struggling to get more leads, videos are your answer.